Starting in February/March 2018, my local club the Wellington Warlords is looking to wargame the WotR. 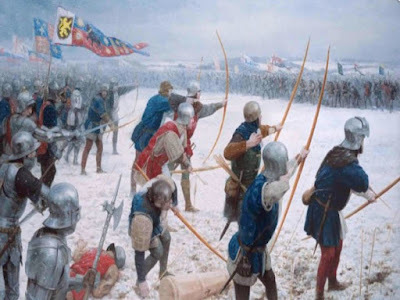 This is the dynastic battle between York and Lancaster at the end of the 15th Century. It was characterised by changing alliances between the English nobles to manoeuvre their favourite into kingship. The idea is to use the DBA rules to run some multiplayer games. These are simple easy to use rules that battle with armies of 12 elements (3-4 figures on each base). The lists are 80% set with some customisation around the edges. Last night I purchased my army from Perry Miniatures. It was one box of plastic billmen/archers, mounted General, artillery piece and foot knights. Cost me NZD 90 including post from UK. Looking forward to stabbing friends and family in the back. After one post at the next Warlords meetign we have attracted two more players so we now have 4. Is it 25/28mm or 15mm? The plan is to do it in 28 mm. So all you need is one box of Perry's foot and a cannon. so for < 30 GPB you are in. Count be in, I have Perry Plastic WOTR for a DBMM army in the making. Will order a cannon this week. Mighty Ape has 1 box of Perry foot infantry left for $39. I'm hoping mine arrive this week and then I'll start on painting them up. We now have 6 people that have expressed an interest. So things are well underway.